The institute is devoted to inculcate a sense of social responsibilities in the students. 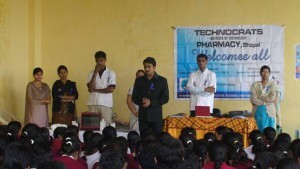 In this direction, the students and faculty of the institute organized various health awareness camps thorughout the state, targeting the rural and backward areas. In the camps, the delegates of the team conducted blood tests for detection of malaria, performed water testing for potability and distributed free medicines to the needy under the supervision of competent authority. Water testing team of institute with PHE Department officials of Govt. of M.P., in PHE water analysis laboratory, Guna. The P.H.E. Department was kind enough to associate with the institute team for testing the quality of drinking water in the district. P.H.E. 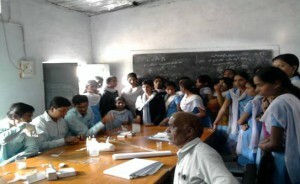 department officials explaining different aspects of water testing to school children. The water testing camp was conducted as part of national pharmacy week celebration “Euphoria”. Free health check-up camp being held as part of National Pharmacy Week. 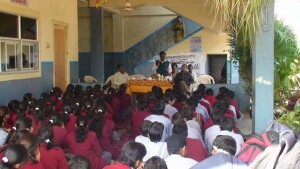 The institute team explaining the hazards of water-borne diseases and encouraging the students to be a part of the Blue Ribbon Campaign for eradication of Malaria from the state. Students from the institute conducting blood group and malaria detection in the health check-up camp at Raghogarh of Madhya Pradesh led under the supervision of Mr. Mohd. Irfan. Students from the institute conducting blood group and malaria detection in the health check-up camp at Biora of Madhya Pradesh led under the supervision of Mr. Mayur Chaurey. 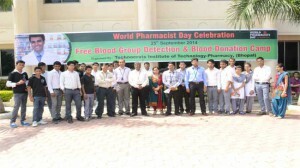 Blood donation was carried out on ocassion of world pharmacist day on 25 september. More than 200 units of blood was collected. 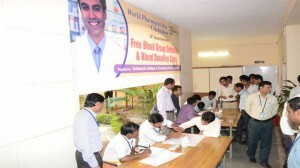 Blood detection camp was conducted in the health camp. Blood group test being done free of cost by the students under supervision of faculty and qualified doctors counselling the patients for health status.